Peak soil & space: A couple of links between peak oil and peak soil: First, it matters that one of the proposed alternatives to oil is biofuels. Acreage around the world is being converted from production of corn, wheat and soy for human and animal consumption--i.e., food--to production of ethanol and biofuels to put in trucks and cars and . . . Which makes remaining corn, et al, more expensive. Some energeconomy geniuses are proposing that Afghanis, for example, convert the fields of opium poppies that are their primary agricultural export, not to growing grains or legumes or other staple foods, but to biofuel (http://www.theatlantic.com/magazine/archive/2011/03/putting-poppies-in-the-gas-tank/8379/ ), which would, not coincidentally, make the gasoline that goes in American military equipment much cheaper and provide Afghanis with a profitable market item rather than food. According to a 2009 National Geographic staff report, (http://ngm.nationalgeographic.com/2009/06/cheap-food/bourne-text ), “The corn used to make a 25-gallon tank of ethanol would feed one person for a year.” Tell that to Archer-Daniels-Midland, Al Gore’s deep-pockets friend and mega-ethanol and corn products producer. In the United States and elsewhere in the developed, read “First” world, arable land has reached peak production. All those petroleum-based products that fueled the Green Revolution of the last century, also produce so many crops, constantly, with support from toxic chemicals and without concern for the microbes that make soil a live, self-regenerating system, that most American farmland--if its farmers didn’t go organic a while back--is comprised of dead soils. Peak oil makes a repeat of the petroleum-driven 20th century Green Revolution impossible (http://ngm.nationalgeographic.com/2009/06/cheap-food/green-revolution-illustration ), which is good for soil and other living things, not so much for food prices and supplies. Climate instability. Bad -- uncongenial -- weather has lately devastated crops in the upper Midwest, Florida, Mexico, Russia, China, Australia, parts of Africa and elsewhere. Many climate scientists believe we've passed the equivalent of peak friendly and familiar weather, too. And while increasing heat will bedevil harvests (http://ngm.nationalgeographic.com/2009/06/cheap-food/stanmeyer-photography), intense cold, downpours and flooding, drought and destructive storm systems will make farming an increasingly hellish occupation if profit is what's being farmed for. The transitional climate will be unpredictable from season and will produce more extremes of weather and weather-related disasters which means farmers will not be able to assume much about growing seasons, rainfall patterns and getting crops through to harvest. If the past is precedent, the transition from the climate we've been used to for 10,000 years to whatever stable climate emerges out of climate chaos next, could take decades, centuries or even millennia. Especially if we keep messing with it. When a whole nation's or region's staple crops, especially grains, are lost or on-again-off-again, everything down the line from the crops themselves become more expensive, from meat, poultry and dairy to every kind of processed food. I.e., the food we shop for as if supermarkets were actually where food comes from. The roller-coaster economy. This isn't the place for me to offer my explanation for the probability of global economic collapse. (See http://www.ellenlaconte.com/excerpts-from-life-rules/#chpfour for that.) No pundits, talking-heads or economic analysts (well, very few) deny there are rough economic times ahead. Even many of the cautious among them acknowledge that we may be looking at five or six years of high unemployment and many of the lost jobs won't be coming back. The less cautious, like me, predict the collapse of the whole fossil-fueled, funny-money, inequitable, overly-complicated global economic system in the lifetimes of anyone under 50. Well, at the rate we're going in all the wrong directions politically and economically, I hazard the guess, anyone under 80. 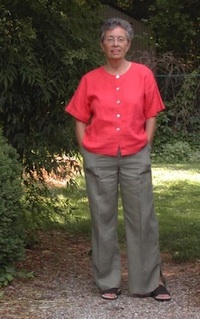 Ellen LaConte, an independent scholar, organic gardener, freelance writer, speaker and editor, living in the Yadkin River watershed of the Piedmont bioregion of North Carolina, is a contributing editor to Green Horizon Magazine and The Ecozoic and Advisory Board member at the EarthWalk Alliance. She was assistant to the late homesteader and bestselling Living the Good Life author, Helen Nearing, and as Nearing’s executor helped found The Good Life Center at Forest Farm in Harborside, Maine. Her memoir of Nearing, On Light Alone was published in South Korea as well as the US. Her most recent book is the controversial Life Rules: Why so much is going wrong everywhere at once & how Life teaches us to fix it (Green Horizon/iUniverse, 2010) can be examined at www.liferules-thebook.info. LaConte publishes a quarterly online newsletter, Starting Point, and can be reached at www.ellenlaconte.com. For an analysis of post-peak supply, please see Our Post-Peak Oil Future.pdf - Culture Change. Jeff Strahl wrote: Good article by Ellen LaConte, but one big miss, in the last paragraph. She says. "Under the influence and auspices of the prevailing economy, most Americans have forgotten how to provide for themselves. We've become accustomed to earning money with which we buy provisions." http://www.monthlyreview.org/798wood.htm and The Great Transformation by Karl Polanyi. The people enclosed had no way to survive except by selling their ability to work, their labor power. They became the English working class. This process has been repeated in every place capitalism has expanded into, it is the essential feature of this system, as capital grows only via exploiting labor power to create a surplus. In the US, the land was first seized from the indigenous peoples, then later on those farmers who did manage to obtain parcels were largely forced out via various corporate activities. The Enclosures are going on in more places and on a larger scale then ever before. This is why the notion that "Gardening -- and small-scale farming -- while they will need to be undertaken in a businesslike fashion" makes no sense. "Sustainable capitalism" is an oxymoron, capitalism requires separation from the means of producing needs in order to even exist, let alone thrive. LaConte is right on, as usual. This is why the notion that "Gardening -- and small-scale farming -- while they will need to be undertaken in a businesslike fashion" makes no sense. "Sustainable capitalism" is an oxymoron, capitalism requires http://www.westwoodtekoop.com/...edels.html separation from the means of producing needs in order to even exist, let alone thrive. Thanks for the information. Today's food prices are going up, gardening can help us save money and protect our foods from chemicals.